After Halloween, the whole point of candy is power. Remember emptying your bag on your bed or on your floor like you won the lotto? Did you sort your riches too? Did you bag them separately? Did you hoard them until the snow melted and they grew stale? What about candy trading? That’s the ultimate power trip. Especially if you have younger siblings; they–who don’t know the value of select items. My oldest asks what I’ll give for his Butterfinger. Yes, even though I am a Mom–the ultimate power figure–I am still subject to candy power. But I brandish it as well. 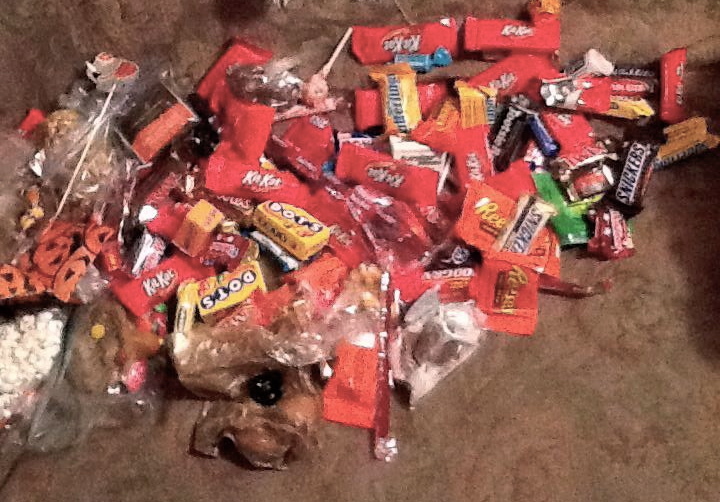 Candy tax is what you impose for all the help you give on Halloween… basically things you do on other days for free: like fixing dinner, driving kids around town, tucking them in. It can also be used in the days and weeks after Halloween as a penalty. Leaving your laundry on the floor? Be creative, parents. The power is yours. Right now I’m sitting in bed with all the leftover candy from what we gave out. I call out the favors I need, and kids magically arrive to do them–in exchange for something in the basket. No, taking my workout bag upstairs is not worth a Twix bar. I only have one. What about two tootsie rolls and a mini Milky Way? …There’s power in candy, people. Tap it. ps. I eat Fair Trade candy most every other day of the year; and often share. pps. To read more about my “take” on Halloween, click here. ppps. To read more about my family & holidays, click here. You brought back a lot of memories. My how times have changed though. We went from eating donuts our neighbors handed out to checking for razor blades in apples. Now it is bring your extra candy to the Orthodontist for a 1$ a pound. My solution this year was to collect unwanted candy from the school I work out and send it to my son who is serving in Afghanistan. While he or his fellow soldiers might not want the calories or the cavities, it will be a taste of home for them when they open the boxes full of TRICKS and TREATS.